After becoming a skincare enthusiast I always scout for new websites offering different brands. We all know about major shopping portals offering skincare and makeup products. Today I will be reviewing a website which I personally feel is a heaven for skincare, and that is Clickoncare.com. Now you might say what is so unusual regarding the website to call it as a heaven for skincare. Let me tell you they stock up products from over 700 brand, yes you heard (rather read) it right. Let's get into how the website is and how their services are. The website is very simple with a fuschia pink layout, easy to navigate and user friendly. They absolutely have no gifs for menus or brand pages. This makes the website load fast. However I personally feel an attractive makeover for website wouldn't harm 😣. Also the website needs to be optimized for mobiles or tablets. Coming to my shopping experience, due to the easy navigation, the product search process was easy. Once you register on the website you rece a welcome SMS on your smartphone as well as a welcome e-mail on registered email address. While I was searching for some particular products through the search tab, the products didn't appear in the search suggestions. The reason being those products were out of stock. This shows that the website is excellent in terms of functionality 👌👌👌. Products which are out of stock are duly marked. Once you place an order you receive an SMS as well as an email regarding order confirmation. Further as your order is processed you receive SMS as well as e-mails at every point of order processing. 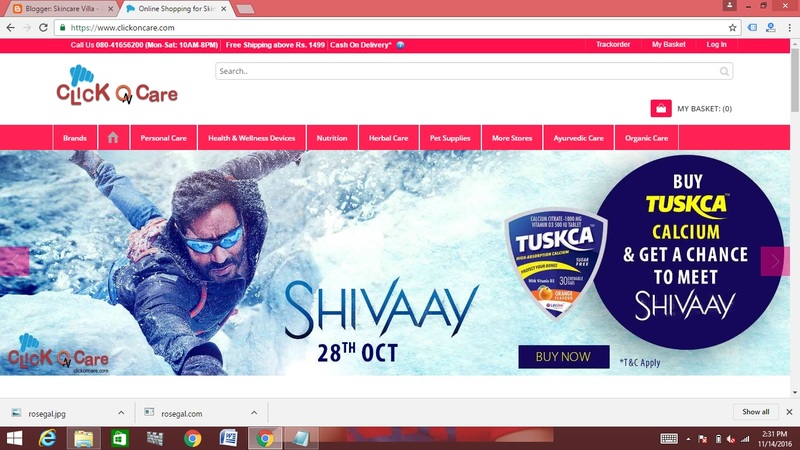 They offer free shipping over 1499 INR and free COD over orders 1999 (post discounts). I feel these threshold limits for these should be reduced by some amounts. Also I feel it would be great if they offer discounts on combos of same brand products and also offer discounts in inbox of loyal customers. Now let's head onto the products which I have shopped from them. Ducray Keracnyl Foaming gelWhen I read Aditi from Serene Sparkle blog's review about this, I knew I had to try it once. After a quick brainstorming session with my 2 fellow bloggers I zeroed in on this and bought. This facewash is very similar to the Bajaj Nomarks facewash and I needed to try some drugstore facewash as I never tried any. So I bought this, and so far it hasn't let me down. 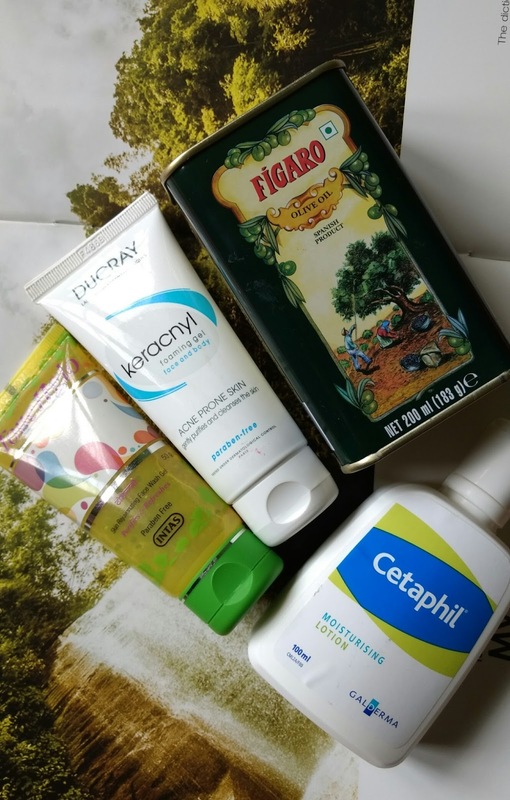 Cetaphil Moisturising lotionMy HG lotion and needed one for these harsh winters. Although it is a bit sticky but nonetheless it hydrates intensively. I will be doing a detailed review of all these products so stay tuned for them. Also now let's talk about the packaging and shipping of products. My orders came in neat bubble wrapped and were packaging in an outer plastic cover. I placed my order on 3rd November 2016 and received it on 7th November 2016. Pretty quick na 😀!! 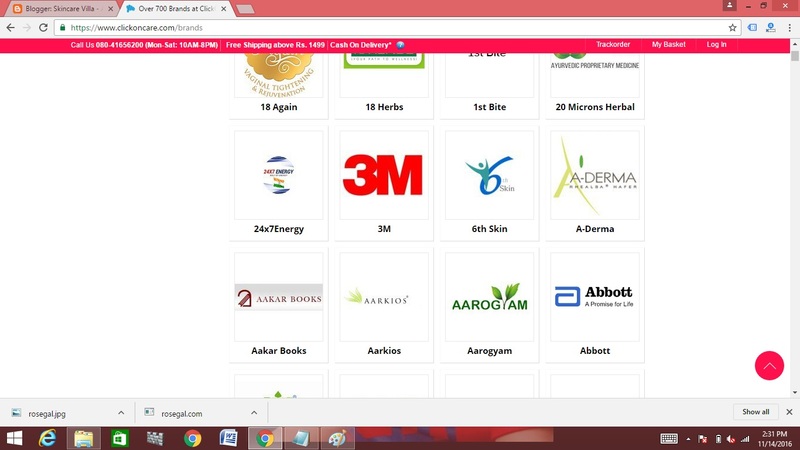 Overall I am highly impressed with the website Clickoncare.com due to the variety of brands they have. You will never find any reason for not shopping with them. I am looking forward to buying from them some of my favourite brands like Auravedic, Vedantika Herbals and Fuschia 😊. 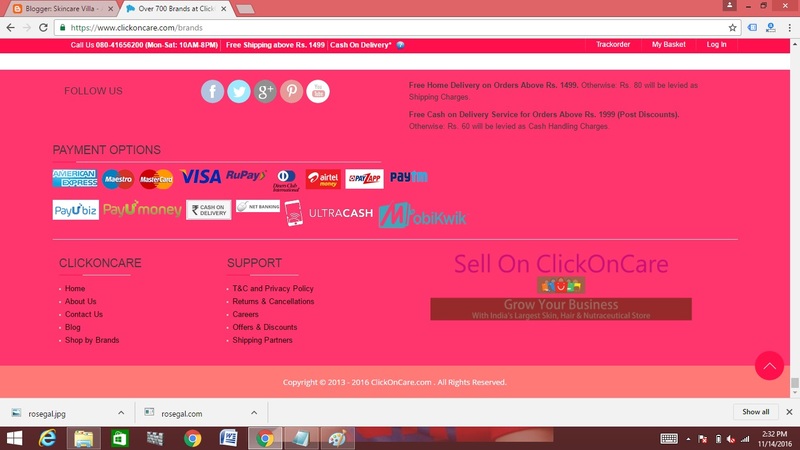 Moreover they have various payment options like card payments, Paytm, Mobikwik, COD which caters to everyone's needs. How about you? Check their website once and tell me you were tempted to buy anything😉.